The purpose of this thread is to enable people to check if their formatting works and to play around with their MathJax code. To use this sandbox, look for a free answer below which says "This answer is free for anyone to use". If one exists then please use it. Else create a new answer. Start writing your answer there. Be sure to save a first draft quickly, to minimize the chance that that someone else concurrently tries to use the same free answer. Then, edit it as often as you like. When you reach a point that you'd like to post it to the intended target answer, simply copy it there and post it. When your answer is complete and you no longer need the sandbox draft, please "clear" the draft by deleting all of the text and replacing it with the text "This answer is free for anyone to use". This is important because it eliminates TeX code (which may slow down MathJax rendering). An alternative is to use Benoit Schweblin's StackEdit. 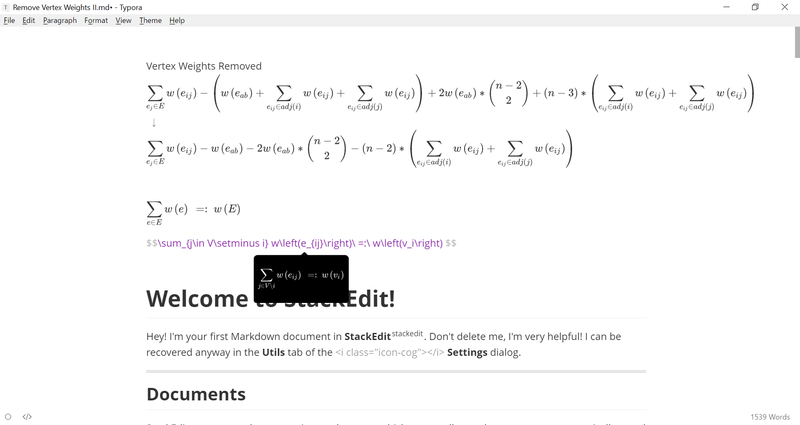 While StackEdit is designed for much more than just editing your MathOverflow posts, it supports essentially the same markdown+MathJax flavor as MathOverflow. There is recent overview of markdown editors for windows. I was searching for an alternative to Stackedit (which I had used for some time), simply because I missed basic file handling in the menues ("open", "save", "save as") and found, that Typora mentioned in the overview, fitted my bill (there are also downloadable versions). A disadvantage of Typora is however, that it doesn't support aligning in equations; in that respect stackedit is superior. A picture says more than a thousand words: one of the things I like, are the tooltips displaying a wysiwyg image of the formula you're editing. Not the answer you're looking for? Browse other questions tagged support mathjax editing sandbox . “Answer your own question – share your knowledge, Q&A-style”: is there consensus among MO moderators? Is here something like blog service or just sand-box to store notes ?